This is a step-by-step article on how to analyze data in ExperienceFellow to generate deep insights into your customers’ experience. Before you start your analyzis, it’s helpful to make a few preparations, especially when looking at tags. A very helpful first step towards the analysis is to think of categories for touchpoints (those who have experience with qualitative research analysis might know it as coding data). Categories can describe diverse topics. You can look at processes, e.g. create categories like: booking process, check-in, payment. You can examine geographic areas and/or departments, e.g. reception, public transport, parking. You can also research channels, e.g. website, mobile, face-to-face. 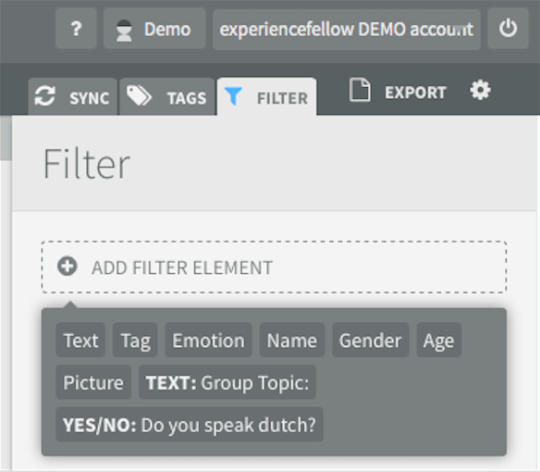 In ExperienceFellow, these categories are called tags, and tagging a touchpoint simply means assigning an experience to one or more categories. There are two ways of assigning tags: The top-down approach and the bottom-up approach. Now you can start having a look at your dataset. Before you dig deep, get a first impression of your participants and touchpoints. On the participants overview you can see a list of all participants that have signed up for your research project. Clicking on the name of a participant will display their profile, which includes the information they have provided themselves (in case your project settings request them to fill in a profile), and an overview of the data they have synced. The participants overview gives you more information on the customers/guests/stakeholders who participated in the project. The raw data is to be found on the perspective overview. Each line shows you the journey of one participant, each square is one report or touchpoint. On the top of each journey you find a quick reminder of the participants’ main details as well as the average emotion score of their experiences. If you’d like to view the journey on a graph, you can extend the view by clicking on the little arrow. The counting bar shows you how the touchpoints are distributed. You can use it in the raw data, but also in the perspective you have created. It helps you to instantly get an impression of how the experiences’ emotional values are distributed within the dataset. The counting bar indicating the number of positive, negative and neutral experiences. It’s time to dig deeper. The tools of ExperienceFellow help you to make sense of the data you see, turn it around, squeeze it and gain real insights. To start your analysis, you need to clone a version of the raw data submitted by your participants. That is what we call a perspective. You can use perspectives to analyze the data without losing the original sources. The raw data remains untouched, no matter what you do in a perspective. You can create multiple perspectives to focus on different aspects or to research different points of views. For instance, if you have multiple researchers working on the project, each of them can create their own perspective, analyze the dataset from their individual point of view, and afterwards compare their findings to others (researcher triangulation). On the perspectives overview you find your raw data, as well of your different perspectives. A data cleanup of your perspective at the beginning of your work will make analyzing data easier. Delete touchpoints and entire journeys if they are not relevant. 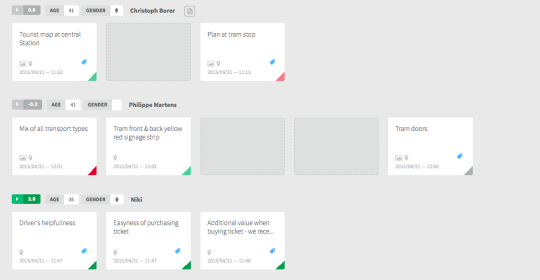 Drag and drop touchpoints along the customer journey to adjust their sequence. Sorting them makes a comparison of different journeys easier. Insert gaps to sort data in rows, but also to mark missing touchpoints. You can add gaps by positioning the cursor between the two touchpoints where you want the gap to be. A small plus-symbol will appear. By clicking on it, you can insert and delete gaps. Customer journeys with inserted gaps. 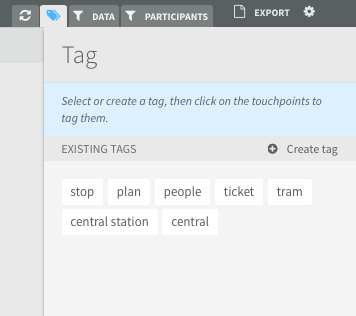 A tag is a specific title that you use to code your data and categorize similar touchpoints. Tagging will help you filter the data in order to find certain patterns. Add one or more tags to the touchpoint by just typing it into the field, or choosing out of the list of tags you’ve already used. We have prepared a dedicated article on tagging here. The tag manager to create, edit, and delete tags. Use the filter tools to analyze and explore the data submitted by your participants. 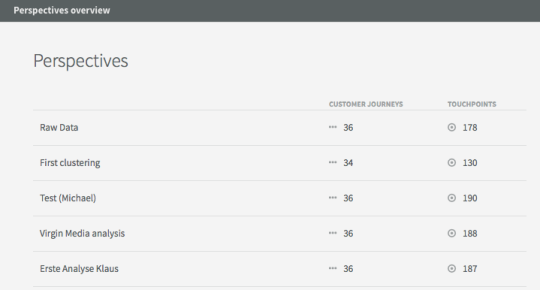 You can use a data filter to find touchpoints matching certain conditions, or a participant filter to search for customer journeys. Here comes a quick description of the standard filters of ExperienceFellow. Please note, the filters depend on your project setup. If you did not collect gender data from your participants, you won’t find the respective filter here. Text. Search for keywords across all text fields (description and title). Please keep in mind that people might have included some typos or used other expressions/synonyms for the term you’re looking for. Tag. Both the predefined tags as well as your own manual tags are included in this search. Emotion. Select the emotional values you’d like to highlight – one or more values can be selected at the same time. Name. Search for a certain participant’s name. Gender. Highlight male/female/other participants only. Picture. Highlight only those touchpoints that have a picture attached. Custom questions. Filter by the questions you have added on your own. You can also use multiple filters at the same time, e.g. look at the experiences from female participants with a negativ value on the satisfaction scale. If you want to have a look at the entire dataset again, you need to remove the filters. If the funnel symbol next to the filter menu is colored, you have an active filter, if it’s grey, the filters are not active. The counting bar can also be useful in perspectives, to learn how many touchpoints fit your filter request and shows the amount of negative, neutral, and positive touchpoints. For example, you could find out that women (participant filter / filter by gender) have mainly negative experiences with touchpoints tagged with “central station” (data filter / filter by tag) and “night” (data filter / filter by text), but men don’t. Then you can go in depth and see what happens to women by looking at the highlighted touchpoints. If you have tracked GPS data, you can see how your participants moved around on a geographic map and compare their journeys. 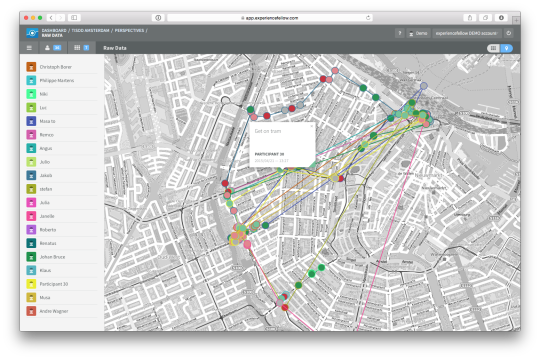 All journeys with GPS data can be displayed on this map, and you can also highlight single or multiple journeys by hiding others. Each point on the map illustrates one experience, the colored lines connect the touchpoints of one journey to each other. 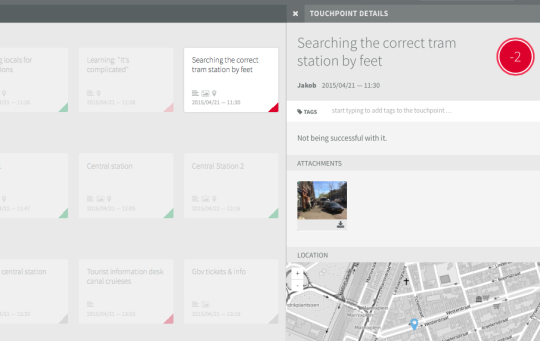 Click on a point to show touchpoint details and see what happened at this touchpoint. Hence, clusters of positive and negative touchpoints give you a hint of where you should dig deeper. What happens at this place? What is going wrong and how can you improve it? By the way, the filter function can also be applied on the map. If filters are active and you click on the map, only the filtered data will be shown. 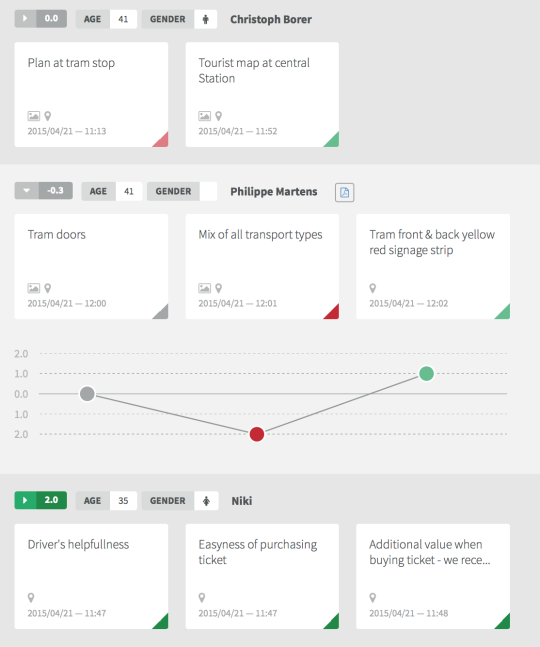 Overview allows you to discover different angles and views of your collected data. Use multi-dimensional filtering options to unveil meaningful correlations. This is a powerful feature to also generate statistical outputs. We have prepared a dedicated article on this feature. Comment on touchpoints to make sense of your data, add notes and to share your insights with other researchers. You find the comment mode on the bottom of the touchpoint details. There are several ways to export a customer journey. Use the PDF export to create high-resolution exports fo single or multiple customer journeys. You can also print the PDF and use the journey maps for your upcoming workshops. Use the CSV (Excel) export in order to further analyze your data and make calculations. Hence, you can use the export for both qualitative and quantitative data analysis. If you’d like to see a video on how data analysis in ExperienceFellow works, check out this video on how to analyze data in ExperienceFellow. If you’d like to know how to set up your own ExperienceFellow project, check out the ExperienceFellow quick start guide.